Planning your kitchen and food storage area can be a bit overwhelming. There’s a lot to think about and depending on what type of set up you decide on, it can get expensive to build. 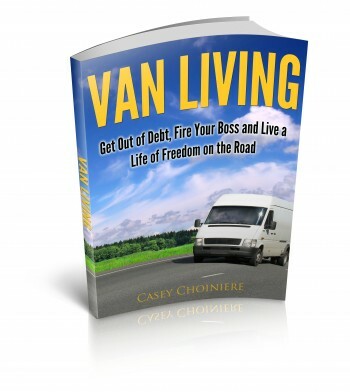 Many people decide that they want to be able to cook inside the van they’re living in. 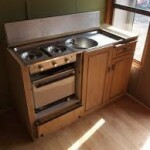 If you want to have a cooking area inside your van you’ll need to devote a decent amount of space to the kitchen. You will also need to consider some key elements such as proper ventilation, lighting and mounting a propane tank in your vehicle. Ventilation is important if your cooking inside, improper ventilation can lead to buildup of carbon monoxide and can be very dangerous. 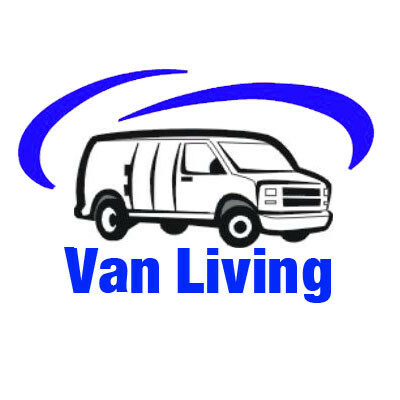 Depending on your van you can use a window mounted fan near your stove or you can install a fan in the roof. A roof fan is the best option because it also helps to remove excessive heat from inside your van on hot days. No matter what ventilation system you choose, you should install a Carbon Monoxide detector in your van for added safety. If you choose to cook outside you’ll just need a simple portable camp stove, a small propane canister and a folding table or some sort of platform to use. 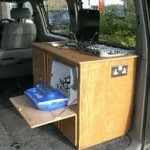 Many people build a platform that is accessible from the rear door of the van. Having your kitchen accessible from the rear of your van may still require some ventilation to avoid excessive food smells from building up inside your van. If you choose to cook outside it is especially worthwhile to buy or build an awning so you have a place to cook in rain and bad weather. There are many awnings that can be purchased for just about any style of van you’re living in. You can also build one for a fraction of the price that will be highly functional for any van living adventure. I have always cooked outside and find it to be more enjoyable than crouching inside a van and having all of my bedding and clothing smelling like what I ate for dinner. Food storage can be accomplished in several ways as well. 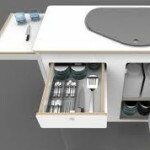 Depending on your budget and how you desire the interior of your van to look you can accomplish food and kitchen utensil storage in several ways. Before you decide on a system, list all of the things that you’ll need to store. Will you be storing all of your food, water, utensils, pots and pans? How about a cutting board and other kitchen items like tin foil and plastic bags? Having a good idea of what you need to store will help you decide what the best system for your needs is. It is possible to just buy a set of plastic drawers and utilize them for your storage needs. The downside of plastic drawers is that they aren’t very sturdy and they come in limited dimensions. The good thing about them is that they’re easy to install, cheap and very light. A set of plastic drawers will not add additional weight to your van (weight should always be considered when building your van). Another option is finding a piece of furniture (dresser,cabinet,chest of drawers etc.) and re-purposing it for use as your food and kitchen storage area. This can be an easy option and if you shop around at second hand stores you can find something that is low cost and suitable. re-purposed furniture can be heavy and unfortunately, just like with plastic drawers, you’re limited by the dimensions of the furniture you can find. It is possible to buy pre built kitchen set ups. 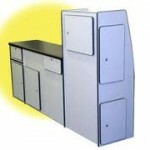 This is generally really expensive but you can buy custom fit kitchens for many popular van models. If this is the route you choose, shop around and you might find a good deal. 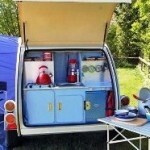 Even if you find a kitchen unit that isn’t specifically designed for your van, you can generally make it work, as long as the dimensions are within your specifications. Check sites like Craigslist and Ebay for used kitchens. The final option is to custom build a storage area to suit your needs. Depending on your wood working abilities and what tools you have available this can be the best option. If you choose to custom build your storage area you can design it precisely for your needs. make sure to choose durable, lightweight materials when you build your storage area. Most basic storage can be built with a 1×1 boards and thin plywood. Building your own custom storage is fun and rewarding.